1. Time with your teens. These are the last few years you have with your child before they start their adult lives. Spending this time with your teen, getting to know the adults they will become, is incredibly rewarding and something that will go a long way towards a good adult relationship in the future. 2. Teens are not yet done growing up. High schoolers are not yet adults. There are still some tough times ahead, still much growing up to do. Being able to continue homeschooling at this time allows for breaks, down time, long chats with mom or dad, and time outside. Basically, homeschooling allows for more freedom and bending of schedules and rules which can go a long way during periods of growth, whether they be physical or emotional growth. Imagine how nice it must be to stay in bed until noon and still have time to get everything done. Or to go to a movie mid-day because a mental break is in order. Homeschooling, by its very nature, makes it easier to grow up. Worried about being able to teach high school material? Or maybe you worry about being able to find material in your student’s area of interest? Today there is no need to have this worry. There are so many resources available to homeschooling parents and teens that if anything, you may have trouble deciding what materials and resources to use and what to study. Your teen can dual enroll while attending a public high school, but the ease at which many homeschoolers dual enroll and use this resource is quite remarkable. Dual enrollment allows your teen to earn college credit during their high school years. This allows one to demonstrate to college officials that they are indeed ready for college work. It also allows teens to get college requirements out of the way before they even get to university. It is not unheard of to have homeschoolers going off to college at 18 and already have sophomore or junior status. In addition to dual enrollment, there seem to be endless opportunities and as a homeschooler it is quite easy to take advantage of these opportunities. Internships, volunteer work, part-time jobs, team sports, political campaigns and traveling are just a few of the activities that homeschool teens can participate in to the fullest. 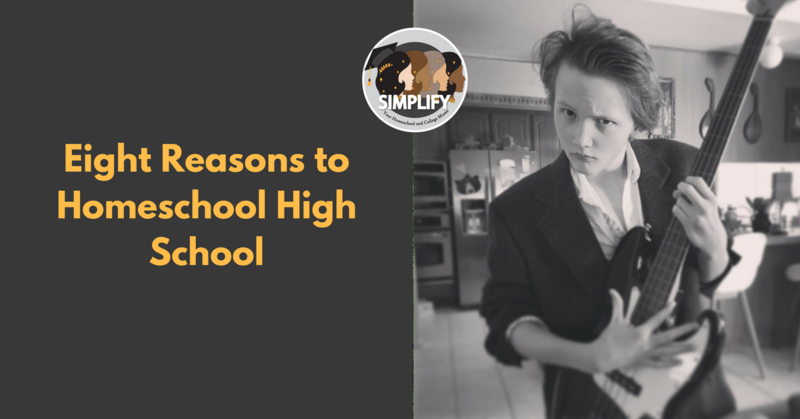 Because your teen is homeschooled, they will be able to take make the most of more opportunities as their schedule is more flexible than if they were traditionally schooled. Need to work late at night? That’s ok because you can sleep in. Have an opportunity to travel to a foreign country for a month? Let’s work your schedule around that. 7. There is (usually) no bullying in homeschool. Taking a teen out of the usual school atmosphere means more than just saying no to public school. It also means saying no to the sometimes toxic culture of public school. Although no environment can be guaranteed bully free, being away from the school culture goes along way to guaranteeing limited time with peers that are likely to bully. And as a side benefit there is also less pressure to fit in, less pressure to have the latest technology, and less pressure to date before one is ready. 8. Teens have more control. Teens, on their way to adulthood, generally like to have some control over their lives. A school environment and all the pressures that go with it, can sometimes make a teen feel like they have very little control. A wonderful benefit to homeschooling is that a teen, along with their parents, can decide what they want to study, what they would like to explore, and what opportunities they would like to pursue. They can customize their high school years in a way that helps them with their long-term goals and having that control goes a long way towards motivating them along the way. For many parents the idea of homeschooling the high school years is overwhelming. Some worry about whether they can truly prepare their teens for college and whether their teens will be seen as competitive by prospective universities. Others worry about being able to teach high school material while some parents are held back by the perceived socialization issue of having a teen at home. But the potential pitfalls of homeschooling high school are far outweighed by the benefits of deciding to homeschool your teen. As you ponder the positives and negatives of homeschooling, be brave! Set an example for your teens and instill in them the joy of learning, the chance to be independent, and the opportunity to chart their own course into adulthood.